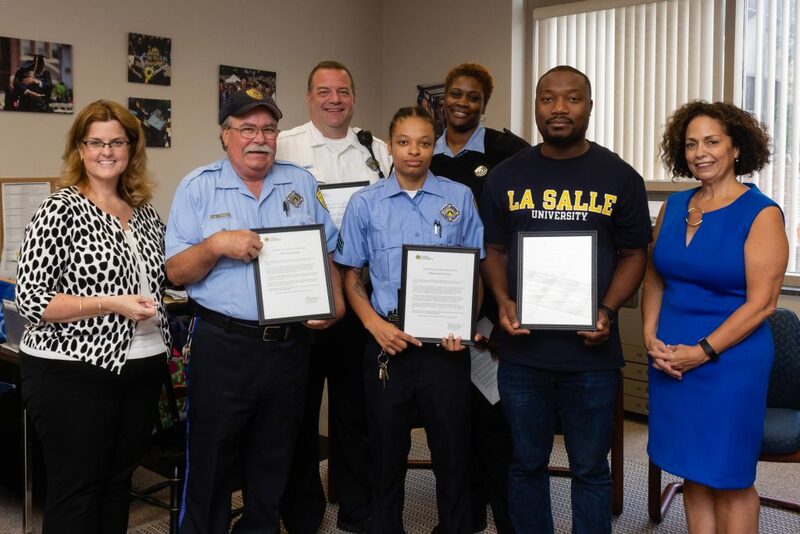 From left to right: La Salle University President Colleen M. Hanycz, Public Safety Officer Joseph Kitchen, Lieutenant John Wesley, Sergeant Danielle Holmes, Officer Aliya Randolph, student Joshua Biawogei, and Assistant Vice President of La Salle Public Safety Amanda Guthorn. On Tuesday, September 11 at 10:47 a.m. in the La Salle University Union Market, an Aramark employee went into cardiac arrest. As she collapsed, Joshua Biawogei, a junior biology student and coincidentally an EMT, caught her and guided her to the floor. Public Safety Officer Joseph Kitchen also witnessed the fall. Attempts to wake her were unsuccessful, so they immediately began CPR; Biawogei providing chest compressions while Officer Kitchen did rescue breathing. Officer Kitchen then radioed dispatch; upon receiving the call, Officer Aliya Randolph notified Philadelphia Fire Department EMS and continued to provide the most updated information on the patient. Additional Public Safety Officers Lieutenant John Wesley and Sergeant Danielle Holmes arrived on the scene a short time later; Lt. Wesley assessed the patient while Sgt. Holmes retrieved the closest Automated External Defibrillator Unit. Lt. Wesley provided a shock to the patient and continued CPR for several minutes while Sgt. Holmes went to Olney Avenue and 20th Street to guide emergency responders to the Union. Lt. Wesley revived the patient prior to the arrival of EMS, who then transported her to the hospital. As a result of the actions of these five individuals, the employee is awake, alert, and on the road to recovery.